The prospect of preparing a new horse for its first endurance training ride may seem daunting to beginners but with the appropriate planning and commitment both horse and rider will comfortably cope with their first ride. This article is a simple introduction to the feeding and training needed to adequately prepare an inexperienced horse for its first training ride. 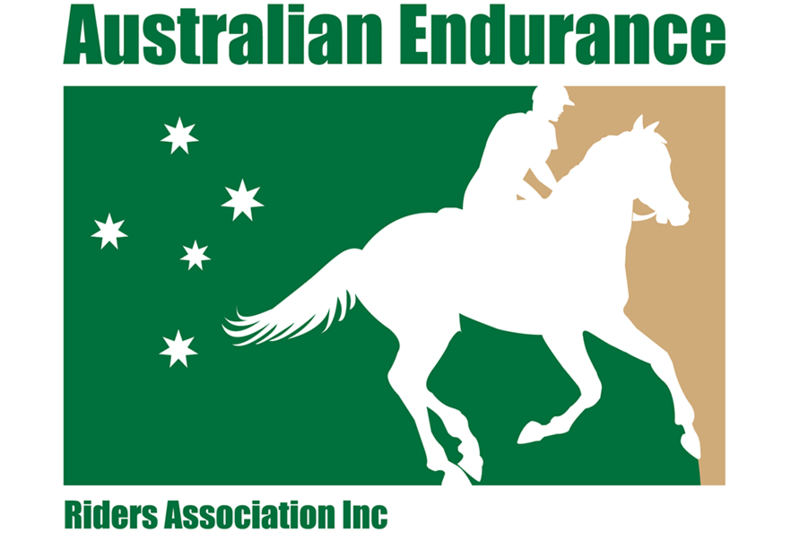 It is not intended to be a detailed program and the "further information" section at the end of this article will point you in the right direction to get more detailed literature on endurance riding. Long slow distance work is the basis of preparing a novice horse for a training ride. You should plan on riding the horse three to five times per week and allow twelve weeks to get an inexperienced horse fit for its first 40 kilometre training ride. Always remember that rest is critical to the conditioning of an endurance horse as it allows the horse to recover from the stress of training. The training sessions should each be about 1 hour in length with a longer session of two hours or more included once per week. The horse should be "legged up" at the walk only over flat terrain. Although this is relatively boring for the rider it is crucial to build strength in the legs and condition the horse for its future training. During this period it is a good idea to teach your horse to walk-out as fast as possible so that the conditioning effect is maximised and it will also help you to cover more ground later at rides. 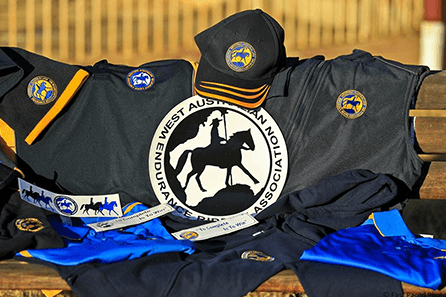 For the average horse this will mean covering about 5 to 6 kilometres in a one hour training session and 10 to 12 kilometres in a two hour training session. You can begin to introduce some trotting (up to 10 minutes per one hour session) interspersed with the walking. When you commence trotting it should initially be for only short distances but gradually increased. During this period you should work on trotting the horse on opposite leads so that it remains even gaited and builds its muscular strength equally on both sides. It is also recommended that you work the horse at different speeds in the trot to develop the horses ability to go along at various speeds and try to cultivate the horse with a calm but confident manner. Increase the trotting to 20 minutes per one-hour session and introduce some hill work. 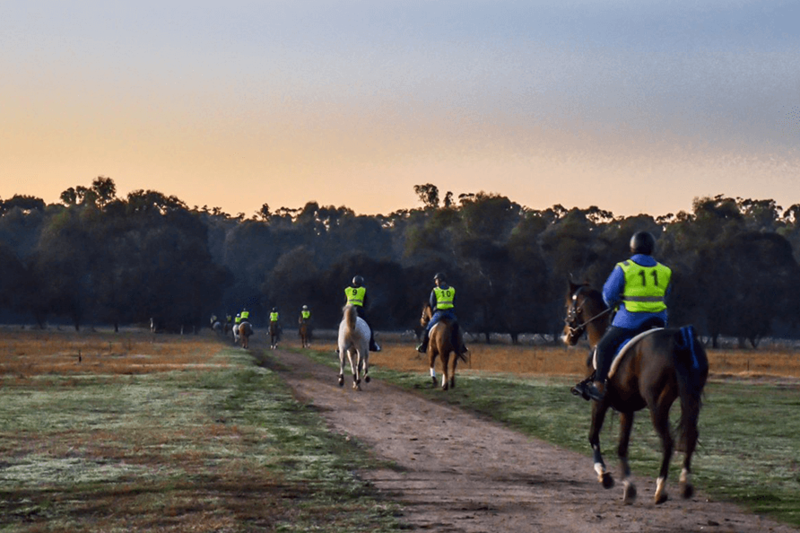 Endurance rides will generally involve some substantial hill work and if you do not have access to bills on which to train it would be wise to float your horse to an area where this is possible. Initially you should walk the horse up the hills and as his fitness improves begin to trot up some of the easier hills. Downhill work this early on should be done at the walk because trotting downhill is hard on a horses legs and you are still looking to strengthen and condition. From now on each fortnight you should increase the amount of trotting gradually (say an increase of 10 minutes per one hour session) and try to incorporate hill work where possible. At this point YOU could also begin to introduce some easy cantering in the same way that you did with the trotting. By the end of week 8 you should be approximately walking half the time and trotting half the time. For the average horse this will mean covering 9 to 10 kilometres per hour. At this point it would be good to do a 20 km intro. ride if there was one available. 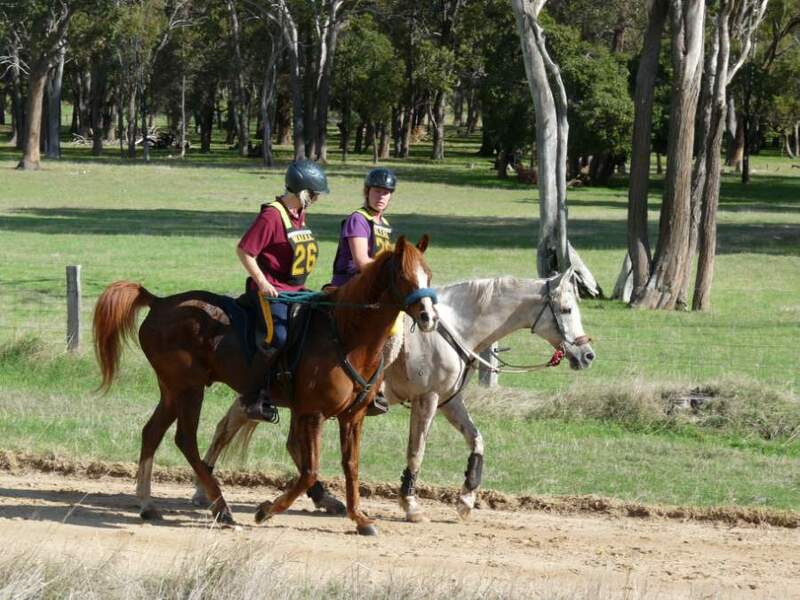 Two weeks before the training ride the horse should be given about a 30 km trial run which would take about two and a half to three hours to complete. This will allow you to cheek how the horse copes without the excitement of the ride. If all has gone to plan and you have had no problems or received no setbacks as a result of lameness etc. then your horse will be ready to attempt his first training ride. During the training period there are also a number of other things you can do with your horse which will help your horse in preparation for the ride. accustom your horse to the veterinary procedures to which he will be subjected in the vetting ring i.e. stand patiently when asked, pick up his feet, be comfortable in having his mouth and rear end examined and trot out easily on a loose lead. By checking your horses parameters at home you will get him used to these and also learn how your horses fitness is developing. try to ride your horse in the company of other horses if possible. At a ride your horse will have to start with forty or more other horses. on longer rides encourage your horse to drink at water points and allow him to relax and graze every now and then. This will ensure that your horses hydration is maintained and gut function is good. use a known measured training track to get a feel for the speed at which your horse travels at various gaits. This will be valuable later on at rides to enable you to control the speed at which your horse is travelling. try not to become too regimented in your training. Both you and your horse will appreciate variety such as different terrain, long slow rides, short faster rides, some flat work etc. The feeding of the horse initially will largely depend on the condition that the horse is in when it commences training. Obviously if the horse is carrying too much condition when started it will need to lose weight slowly and trim down to athletic condition, such a horse will not need much additional feed If the horse is already in appropriate condition it will need additional feed in order to meet the additional work requirements. Basically the horse needs to receive enough feed in order to maintain it in appropriate condition and provide enough energy for the work that the horse is performing. When you are grooming your horse or saddling up you should look at and feel the horses withers, neck, tailhead, girth and ribs to ascertain whether or not the horse is gaining or losing weight and adjust the quantity of feed accordingly. The amount of feed necessary will depend on the quality and quantity of grazing available. Horses with access to good grazing will not need much additional feed except for perhaps a vitamin and mineral supplement. Horses with grazing of limited quality or quantity will need additional feed in the form of lucerne hay and chaff and some energy dense feed such as grain or prepared feed. As a general guide about 1 to 3 kg of hard feed such as oats or prepared feed is adequate for a 500 kg horse. Endurance horses require good levels of vitamins and minerals in the diet so always ensure that the diet is balanced correctly. Always reduce the amount of grain fed to your horse on rest days by at least half. This is very important to prevent tying-up. Electrolytes are important for endurance horses. Sweat contains high levels of electrolytes which must be replaced or horses become prone to fatigue, dehydration or more severe problems. Horses that are worked and sweat heavily should receive additional salt (25 to 50 grams) and an electrolyte supplement formulated for heavy sweating horses performing long slow work such as endurance horses. Avoid feeding electrolyte supplements with sodium bicarbonate as they are designed for fast working horses. Water is critical for the endurance horse and a clean supply of cool, fresh water should be available at all times.